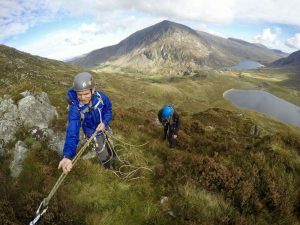 Eight people from Bremex went to Snowdonia for a weekend of advanced scrambling on 8th and 9th October 2016. Accommodation was in the bunkhouse at Gwern Gof Isaf, with a great view from the front door of Tryfan’s rocky profile. We had had hired the services of Rusty Bale, a qualified mountaineering instructor (MIC), who used to work in the mountain rescue unit of the RAF. For the weekend we divided into two groups, each having one day with Rusty and the other day practising with peers. Apart from damp rock for the first hour or two on the Saturday morning, conditions were excellent and kept on improving during the course of the weekend, so that by the Sunday afternoon the weather was absolutely perfect, making us very reluctant to leave. The term scrambling requires some explanation for the uninitiated. In a nutshell it means something between hill walking and rock climbing, where, as a minimum, three points of contact are needed to ascend or descend on rock. In the UK scrambles are classified as Grades 1-3. Grade 1 routes can usually be done reasonably safely without the use of a rope or other climbing equipment. On Grade 2 routes ordinary mortals (i.e. hill walkers) will probably need such equipment, but experienced rock climbers may be able to manage without it, whereas on Grade 3 routes the use of rock climbing techniques, ropes and other climbing equipment is de rigueur for everybody. The main difference between scrambling and rock climbing is that the latter tends to involve climbing pitches with clearly defined routes on continuous rock, whereas scrambling tends to form part of a mountain journey that may involve sections without rock or the need to use hands. The weekend got off to a start when Rusty arrived at our bunkhouse at 8.30am on the Saturday. To the initial consternation of the less experienced members of our party, he pulled a bewildering array of items of climbing equipment out of his rucksack, but his introductory talk was reassuring and made sense. The main point was the need to be very clear at all times when scrambling whether or not you are using rock climbing techniques and, if you are, to make sure you use them properly, just as you would when undertaking proper rock climbing. After the talk we split up into our two groups. The first group went with Rusty to Tryfan Bach (Little Tryfan), a steeply angled slab of rock, which is one of the premier locations in the country for people to practise both scrambling and rock climbing techniques. 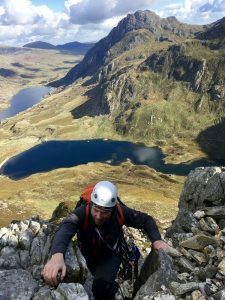 These were the more experienced group and they completed a Grade 3 route on Little Tryfan followed by the Grade 2/3 Bastow Buttress on the East Face of Tryfan itself. 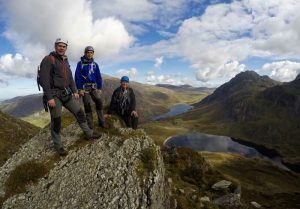 The other group, with included your humble author, started along the heather terrace route up Tryfan, then, with the help of a guidebook, located a Grade 2- scramble known as North Buttress. 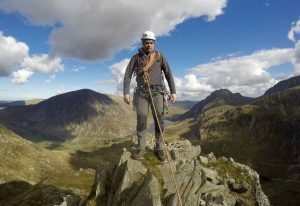 Taking it slowly, and with Bremex’s chairman, Rich Tyler, leading, we managed the route without too much difficulty, emerging on the north summit of Tryfan before continuing to the summit proper. There we witnessed two people performing the hair-raising leap between Adam and Eve, the two pillars of rock that are an unmistakeable feature of this mountain. The next day the first group managed three routes on Glyder Fawr: the direct approach to Seniors’ Ridge (Grade 2), Cneifion Arête (Grade 3) and Gribin Ridge (Grade 1). Our group, now with Rusty, walked up Cwm Idwal to reach East Ridge, a Grade 2 route leading up towards Y Garn. One person had never done any kind of rock climbing before, but thanks to Rusty’s expert instruction and reassuring manner, he not only climbed the route without any difficulty, but also learned how to tie various knots and use other rock climbing techniques. Another member of the group, with limited outdoor climbing experience, had a taste of leading for the first time, i.e. climbing up the rock first and putting in protection to prevent a fall, then building an anchor at the top of the route to belay other people up. There are numerous clubs that do either hill walking or rock climbing, but it is rare that the twain meet. In my experience Bremex is one of the few clubs that crosses the boundary between these two activities. The experience of this weekend is likely to encourage us to do a lot more of this sort of thing. We thought Rusty was a brilliant instructor, not only in terms of his technical skills, but also in the way he struck just the right balance to provide an instructive and enjoyable experience, so we will no doubt be using his services again in future.